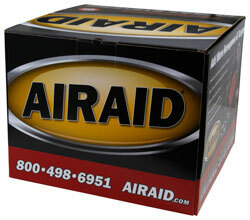 The AIRAID 203-126-1 fits some Buick Rainier, Chevrolet TrailBlazer, GMC Envoy, Isuzu Ascender, and Oldsmobile Bravada models. See vehicle applications for details. The AIRAID 203-126-1 Cold Air Dam (CAD) Air Intake is engineered to give your engine larger amounts of cooler air to produce more horsepower and torque. Cold Air Dam panels channel a steady free-flowing supply of cooler outside air into your engine and also acts as a heat shield to isolate the filter from hot engine temperatures. Blade-style weather stripping mounted between the panels and hood ensure a proper seal keeping the cold and hot air separate. The 360-degree conical AIRAID premium air filter is washable and reusable, less restrictive than traditional paper and provides outstanding filtration. For easy installation the same factory mounting locations are used. Some AIRAID air intakes are not legal for sale or use in California and other states adopting California emission standards, while others are 50 state legal. View the product's vehicle applications to determine the legal status for each vehicle.